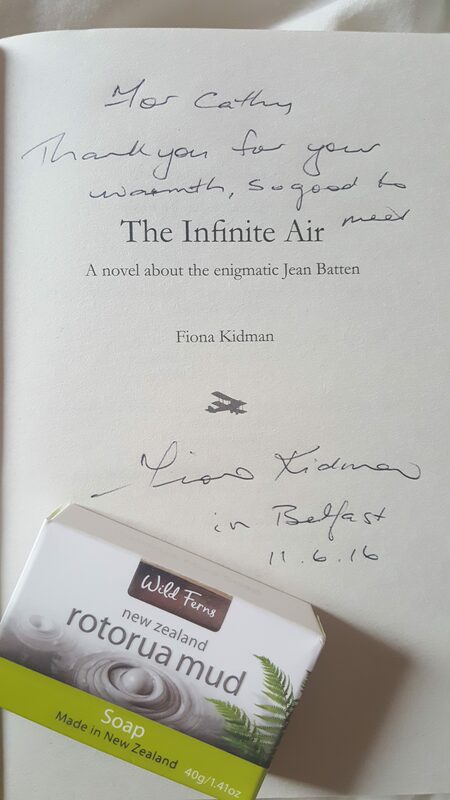 On Saturday evening I took a break from reading my 20 Books of Summer, to interview the wonderful Dame Fiona Kidman at the Belfast Book Festival about her new novel The Infinite Air – a fictionalised account of the life of Jean Batten, world famous 1930s aviator known as the ‘Garbo of the Skies’. The Infinite Air is a thoughtful and fascinating account of Jean Batten’s extraordinary life. In 1934 she became a world-wide sensation when she flew solo from England to Australia in 14 days, 22 hours, breaking the previous record. The impeccably dressed, beautiful and elusive Batten was friends with royalty and celebrity, had a rumoured fling with Ian Fleming and had the world at her feet. Yet she died in a pauper’s grave, from an infection following a dog bite, with no one left to mourn her. Kidman charts Batten’s life from her childhood in Rotorua, New Zealand with her strong-willed mother, philandering father and distant brothers. The precocious Jean could have been a dancer or a concert pianist, but instead, her mother took her to London to train to be a pilot at the famous Stag Lane. The depictions of flight are compelling in the novel and Kidman perfectly captures the loneliness at the heart of both Jean’s flights and her life, portraying her complexity and her fragility as well as her determination and grit. There are men in the book, but the central relationship is undoubtedly between Jean and her mother Nellie. Together, they were a force to be reckoned with. It is a fascinating story, told with insight and grace and allows us to reclaim Jean from the notion that she was just a gold-digger who used men to get her own way. During our chat, Fiona talked about how we need ‘female heroines’ and now that I have met her, she is one of mine. Determined to be a writer from a young age, she was a beacon for women writers in the 1970’s urging them to give themselves ‘permission to write’. She has also worked tirelessly for the literary community, founding her own Creative Writing School, helping to set up the New Zealand Book Council and acting as Patron of the New Zealand Book Council. Now in her 70s, she is awaiting the publication of her tenth novel, researching her eleventh and still inspiring writers and audiences across the world. 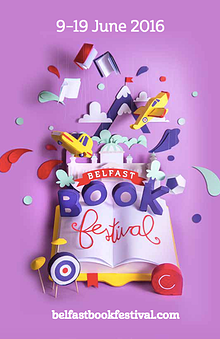 If any of you are in Belfast over the next week, do check out the fantastic events that are going on in the Belfast Book Festival. How lovely to read something about an actual account. So glad you got to meet the author and yeey for the signed copy. Signed copies just make everything so much better. She was amazing Naomi and a really lovely person too. Maybe our best is yet to come?! The Infinite Air sounds fantastic and it sounds like you had a lovely time interviewing Ms. Kidman. Thanks for sharing it with us! A pleasure! The book is really great. What a wonderful post and how nice to read about Dame Fiona Kidman and her writing career. The Infinite Air sounds like a book I would love! I hope you get a chance to read it! I know! I would assume Batten is much more well known in New Zealand, but her story is fascinating.